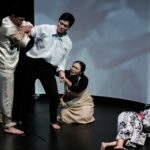 This review has been translated into Mandarin by Liu Xiaoyi, artistic director of Emergency Stairs. Read his translation here. If the avant garde director Robert Wilson died and went to purgatory, Einstein in the Carpark is probably where he’d end up. Part performance, part installation, part misshapen creature stitched together from both forms, this piece by Liu Xiaoyi and his company Emergency Stairs occupies the entire B2-level carpark of the Esplanade – Theatres on the Bay, the first site-specific piece to be commissioned for the arts centre’s Huayi – Chinese Festival of Arts. Beach was a large part of Wilson’s formalist rebellion and in many ways exemplifies his love of structure and minimalism. 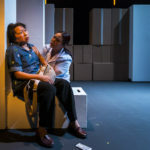 In the same way, Carpark feels like a continuation of Liu’s rebellion against Wilson’s era of postdramatic theatre from the 1960s and 1970s – a sort of post-postdramatic theatre. 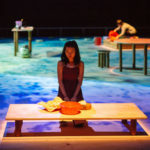 Last year, Liu mounted his own take on Austrian writer Peter Handke’s Offending the Audience (first staged in 1966), in which four unnamed speakers belabour the fact that this production is not a play and nothing will happen, and verbally abuse those present. Liu’s adaptation employed contemporary techniques of “offense” that incorporated technology and overturned current theatre etiquette. 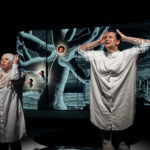 Among the production’s various offenses: terrible live subtitling; barring audience members from taking their seats; and a pre-recorded post-show dialogue that prevented baffled audience members from questioning the artists. This is a prematurely air-conditioned supermarket. As usual you can take photos, take audio and video recordings. or you can choose your own path. Why am I saying so much? Why am I speaking English? I’m not even familiar with this language. It has no meaning to me. Liu introduces an added layer of interculturality into his response to Beach with two performers trained in forms that have very specific physical and vocal vocabularies: the western tradition of musical theatre embodied by George Chan, and the eastern tradition of kunqu (kun opera) embodied by Zhang Jun. Where Wilson was stretching the limits of the structure and forms of western opera, Liu’s ambition to test these limits spans both sides of the globe. 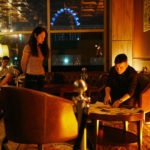 Liu has always had a soft spot for the conversations between cultures. 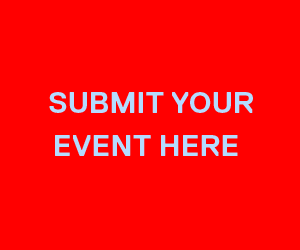 His Southernmost festival in December 2017, for instance, featured encounters and clashes between performers from different countries and from different art forms. 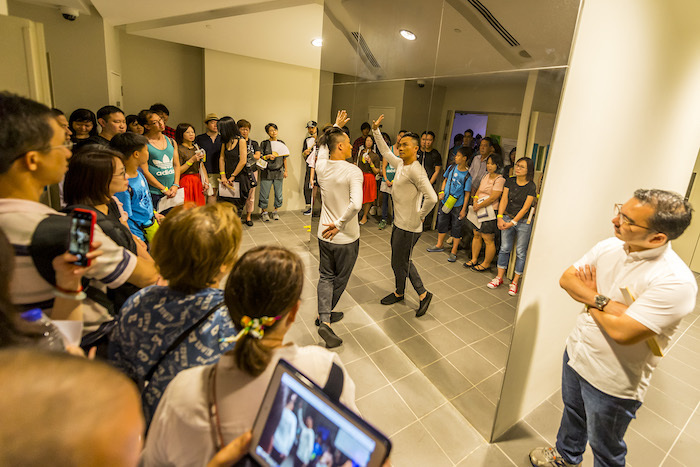 Carpark opens with Chan and Zhang striding across the carpark towards the audience, which is gathered in the holding area of the air-conditioned basement lobby. The duo sit side by side, in-between a pair of sliding doors, and begin riffing on a set of vocal exercises. The differences in approach are clear: Chan runs through scales and tongue twisters to loosen up his vocal cords; Zhang works on his diaphragm, throwing his voice with large belts and whoops. 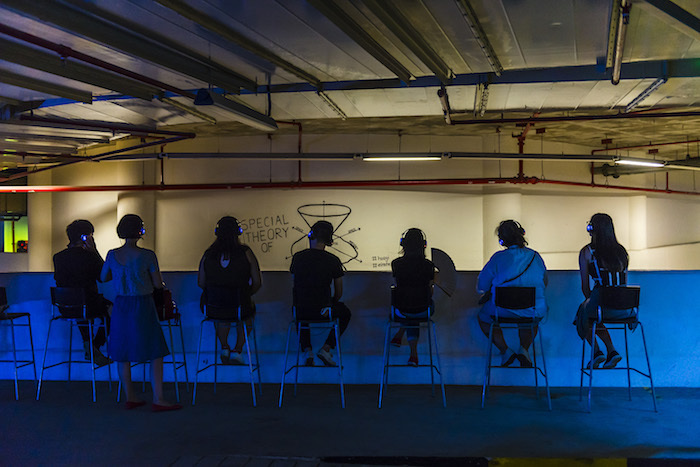 They escape into the carpark – which is still in use, and visiting cars come and go – and the audience is left to roam the space for the next 1½ hours. The subterranean carpark is oppressively hot, and we’ve been instructed to “dress light” and “travel light”; we’ve also been given a paper fan and a bottle of water to arm us against what is to come. 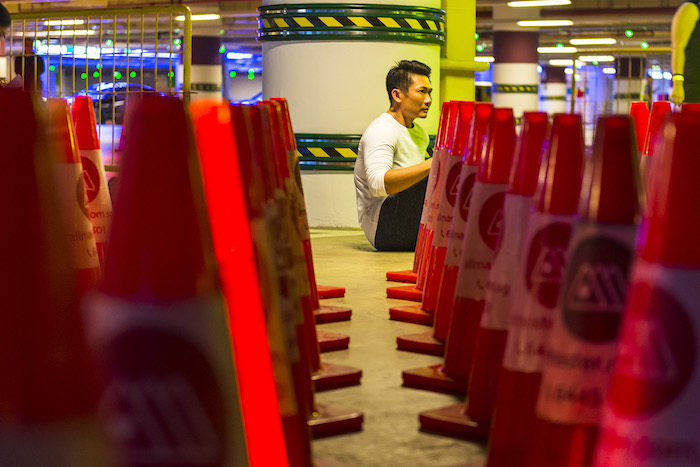 Some of the installations around the carpark are interactive: sound designer Darren Ng has helped to sculpt audio installations hidden in bright orange traffic cones that appear in clusters; lighting designer Lim Woan Wen structures the audience’s experience of the vast space with washes of light that hint at installations in hidden corners or unexpected pockets, including setting the insides of a wrecked BMW aglow with orange light. The carpark is a purgatorial space of entrances and exits, and as we wander, Chan and Zhang vanish and reappear in various locations and on various modes of transport: on foot, on a bicycle, on a scooter. The piece is wilfully, gleefully slow. The performers’ interruptions are spaced far apart and audience members, thirsty for action and intimacy, would swarm them, holding their smartphones aloft. But for all its overtures to its source material, Carpark is less of a subversion of Beach and more of a light sampling. Its references feel like inside jokes instead of interrogations: a copied gesture here, a number sequence there. You could interpret Carpark’s images without knowledge of Wilson or Glass, but outside of the references to Beach they don’t quite stand on their own. And the stage images Liu presents us with are uneven – some are absolutely stunning; others quickly forgotten. They feel pretentious and glib, rather than illuminating or revelatory. Carpark is Beach-lite, not Beach-plus. 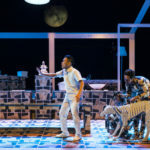 There’s the initial delight of seeing the grand spectacle of opera now reinterpreted in an intimate context outside of the conventional theatre space, but if Liu was attempting to fashion an anti-site-specific work the way Wilson fashioned his anti-opera, he’s barely pushed the form far enough. In the vast majority of site-specific pieces, an atmospheric environment allows for audience members to be constantly engaged with something new. Liu deliberately subverts this with the uniformity of the carpark – a brutalist space that is directly opposed to the exploratory nature of other site-specific locations. 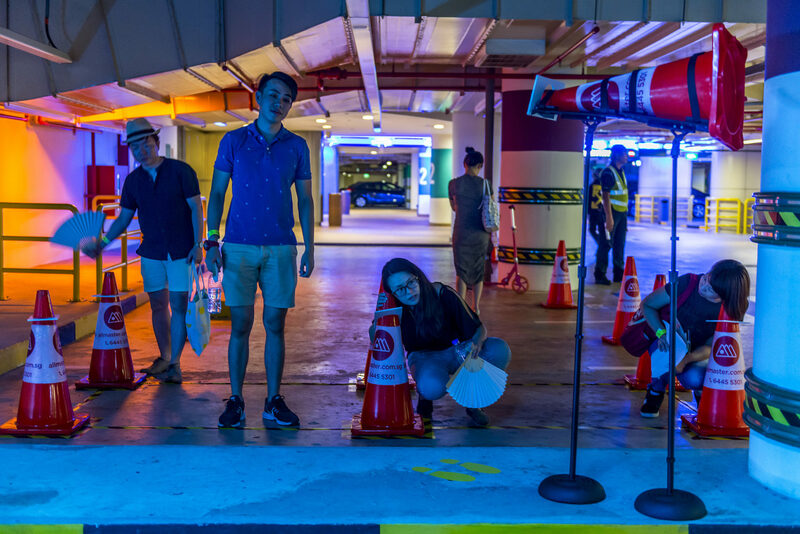 But because the audience is allowed to leave the carpark at any time, by the conclusion of the piece, half of them had fled for the safety of the air-conditioned lobby. Because they’re allowed to opt out, they don’t have to wrestle with Liu’s attempts to choreograph their frustration. The intercultural encounters between Chan and Zhang are also fleeting and shallow. Liu ends up juxtaposing the differences between them with every encounter: Chan speaks German, Zhang speaks Shanghainese; Chan sings a musical theatre standard, Zhang sings a kunqu excerpt; Chan spends most of his time walking and running, Zhang zooms around on a bicycle; Chan wrecks a piano, Zhang crosses a pool of water. 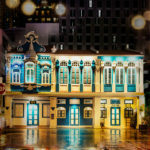 The old cliche about Southeast Asia, and Singapore in particular, is that it’s a place where tradition meets modernity. I’d like to know what else there is. Does it always have to be a binary? There are a couple of instances where these brief meetings go beyond mere contrast, where Chan teaches Zhang a short piece of choreography in the style of Broadway and the West End, with finger-wags and thrusting hips, or when Zhang roars around the carpark in an actual car and eventually decides to give Chan a ride. The friction between these forms is what’s interesting to me, not just how they sit next to each other. This isn’t to say that Einstein in the Carpark is a failed experiment. 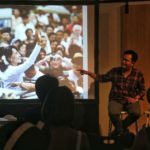 Liu’s remaking of the avant garde canon isn’t something that’s been seen in Singapore before, and demonstrates that what is experimental can soon become what is outdated, slated to be made anew. There are no sacred texts, no sacred visions. Emergency Stairs brings a playfulness and (sometimes irritating) irreverence to what we expect of “the classic” – where iconoclasts such as Bob Wilson and Einstein may very well both be red herrings. It stages performances of questions, not of answers. 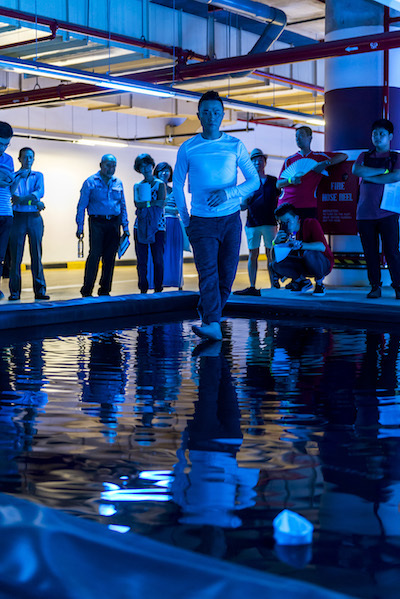 Einstein in the Carpark by Emergency Stairs runs from 1 – 4 March at the Basement 2 carpark of the Esplanade – Theatres on the Bay as part of its Huayi – Chinese Festival of Arts 2018.